The week around 1 April, the pro-Kremlin disinformation machine churned out enough material for us to register almost 50 cases which we’ve divided into seven categories showing how certain narrative templates are used and reused for different stories and adapted to different audiences. These categories range from the usual – “The West did it!” and “It wasn’t us!” – to the outrageous “I can’t believe I’m reading this”, which contains lies so blatant that even the most hard-boiled disinformation aficionado might need to take a seat. Of course, Russian propaganda couldn’t miss the opportunity to spread its Ukraine-related narratives amid the Ukrainian presidential elections, the first round of which took place on 31 March. The narratives in this category seek to instill an inferiority complex in the reader, both on a personal and national level, and to drum up opposition to the political establishment. One case, for example, suggests that voting in the European Parliament elections simply gives a few politicians the opportunity for a cushy life in Brussels, but brings no benefits to average Latvians. This is a popular narrative around election time, used by pro-Kremlin actors to discourage voter turnout and to increase the prospects of populist, anti-establishment parties. Ah, fascism – one of the Kremlin’s go-to refrains for delegitimizing anyone or anything it doesn’t like. Europe is fencing itself off from Russia with a wall of fascism, hate, and Russophobia! In Latvia, Nazis are in power, so there’s no point in voting! More than seventy years after the end of World War II, you might think that Russia has moved beyond such outdated tropes. But that would be asking too much. Like accusations of fascism, fearmongering is another favored pro-Kremlin narrative strategy. 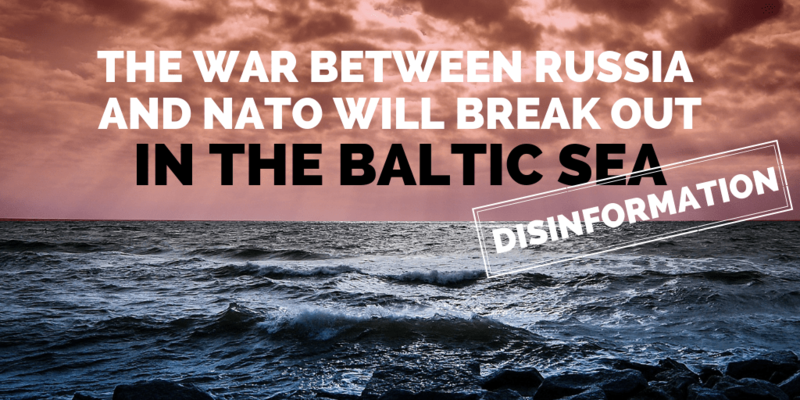 This week, the pro-Kremlin media cited a US report to argue that the conflict between Russia and NATO is likely to lead to a military conflict in the Baltic Sea. Conveniently, the article failed to mention the report’s actual conclusion – that “a major conflict between NATO and Russia remains unlikely”. Stoking fear and perceptions of insecurity is a particularly common tactic when it comes to Ukraine – currently the Kremlin’s chief obsession. Apparently, ahead of the second round of the Ukrainian presidential election, Poroshenko is planning to organize new provocations in Donbas. 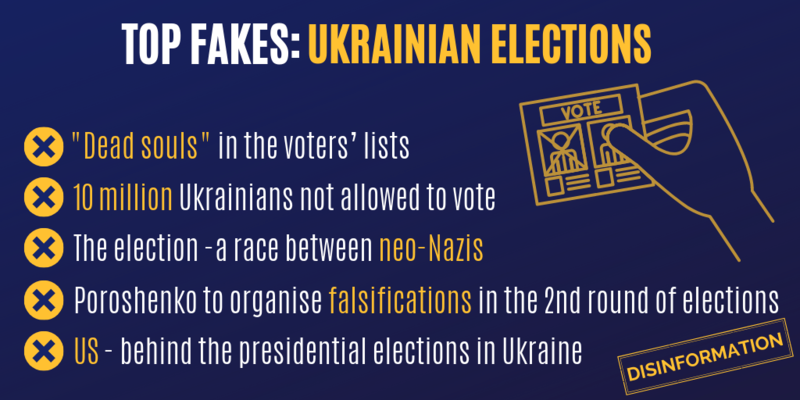 As the EUvsDisinfo database has tracked, disinformation about Ukraine’s alleged aggression and agitation has been at the core of the Kremlin’s narrative strategy from the moment Russia initiated its war against Ukraine. But at the same time, glaring inconsistencies remain – after all, how is it possible that a failing country with a military verging on collapse could pose a real security threat to Russia?! The Kremlin can’t have it both ways, no matter how desperately it wants to. Deflection is another popular pro-Kremlin disinfo tactic. It includes well-known hits like “Kyiv downed MH17, not Russia!“, because Ukraine failed to close its airspace over the rebel-held areas of Donbas. In fact, the BUK missile system responsible for the tragedy originated in a Russian army unit and was taken back to Russia afterward. Other hoax stories deflecting blame from Russia claim that the West is responsible for warlike provocations in the Black Sea and that the Ukrainian government is responsible for the war with Russia, not the other way around. This category also includes great examples of obfuscation: for example, that it’s not clear who shot a protesting crowd in Lithuania in 1991, but it was probably the Lithuanians themselves, or a third party. This narrative likely stems from a recent court decision in Lithuania which found that the former Soviet defense minister and 60 officers were responsible for this crime. “It wasn’t us!” also comes up regarding Russian meddling in the French elections. Yet again, according to pro-Kremlin media, there is no evidence that Russia was involved, and thus confusion persists. In reality, investigations by The Insider and Mediapart.fr established that GRU-linked hackers stole the emails from Emmanuel Macron’s campaign team and that later, pro-Kremlin media spread the news about the leaks. Do Ukrainians actually believe life was better in the Soviet Union than in France and Germany?